Airflyte pens, gifts and accessories can be personalized with a name, logo or corporate message. Many companies use these products to promote new programs, commemorate important dates or as self-promotions. If you don't see what you need here, try this link to Airflyte's master catalog to view over 600 plaques, clocks, acrylic awards and specialty trophies. Airflyte is the most comprehensive Internet site available for corporate recognition awards. We personalize all Airflyte products to your specifications. After browsing the Airflyte catalog, call us at 800-291-5253 to get a quote on the cost to engrave the item(s) you like. 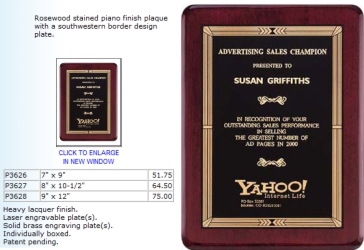 For example, the plaque shown on the left was copied from Airflyte's Premium Line #2 category. Your final cost on one of these 3 sizes would be the plaque cost shown plus an average of $15 to $20 to engrave.